Frequency converter, also known as a frequency changer, is a device that takes incoming power, normally 50 or 60 Hz and converts it to 400 Hz output power. Different types of power frequency converters exist, specifically, there are both rotary frequency converters and solid state frequency converters. Rotary frequency converters use electrical energy to drive a motor. Solid state frequency converters take incoming alternating current (AC) and converts it to direct current (DC). There is no inherent advantage to one frequency over another frequency. But there can be significant disadvantages. Problems occur when the load being powered is sensitive to the input power frequency. For example, motors spin at a multiple of the power frequency. Thus, a 60 Hz motor will spin at 1800 or 3600 RPM. However, when 50 Hz power is applied, the RPM is 1500 or 3000 RPM. Machines tend to be speed sensitive, so the power to run them must correspond to the design RPM intended. 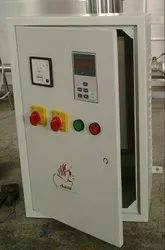 Thus, a typical piece of European machinery needs 50 Hz input, and if it runs in the United States, a 60-to-50 Hz converter is required to convert the available60 Hz power to 50 Hz. The same applies vice versa to convert 50 Hz power to 60 Hz. While standard power ratings and capacities exist for frequency converters, our converters operate over a range of voltages from 100V to 600V. The most commonly specified voltages are 110V, 120V, 200V, 220V, 230V, 240V, 380V, 400V, and 480V. Because our standard and custom design capabilities can meet a range of power system needs, Georatoris your supplier forfrequencyto voltage converters. SAKTHI frequency converters under this category are single phase input & output, power capacity from 500 VA to 300 kVA. 10 kVA single phase 60 Hz to 50 Hz static frequency converter with pure sine wave output, convert 60Hz 120V (US) AC power source to 50Hz 240V (UK) in one step by inner step up transformer. SAKTHI frequency converter is suitable for use with resistive, capacitive, inductive and non-linear loads. Adjustable 0 to 300VAC output voltage. Adjustable 40.0 to 499.9Hz output frequency. Precise 4 LED digital display output frequency, voltage, ampere and wattage. Full galvanically isolated, no harmonic distortion (EMI, EMC). IGBT/PWM technology enhances compact size, low noise and high reliability. Capable to simulate global voltage, frequency power supplies. SAKTHI frequency converters are equipped with electronic circuit/instant trip breaker/buzzer alarm for over voltage, over current, over temperature, output short circuit protection. Sakthi electrical control manufacturing & Exporting Frequency converter for the past 15years and has a strong support for OEM buyers. Many valued customers have considered it fit to clarify our products as "top of the line". It has full technical competency in handling all the technical requirements of clients. Needless to mention, a strong backup team with years of experience has put-high reliability in the product in india & All over world . Looking for Frequency Converters ?